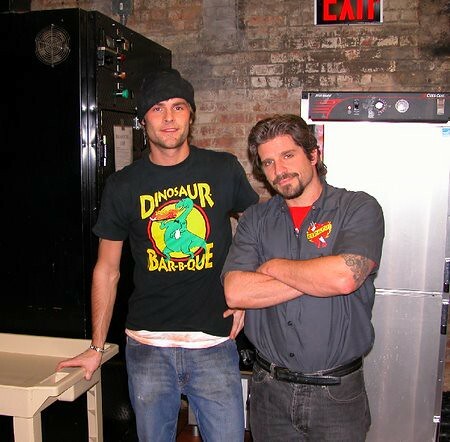 When we’re out in the city one of my favorite places to stop by on the way back to Jersey and pick up some dinner is Dinosaur Barbecue — it’s conveniently located right off the West Side Highway in Harlem, by the 125th Street exit across the street from Fairway Market. 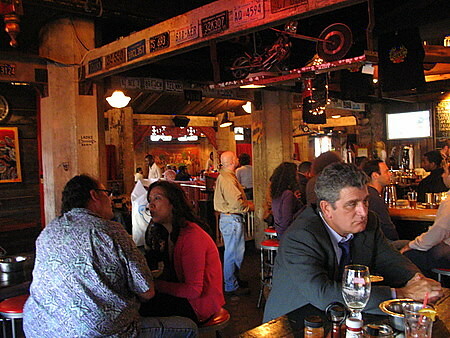 I love the whole biker, badass image of the place — and you could almost say that it was a Disney/Epcot-like portrayal of a biker roadhouse, if it was not for the fact that real badass bikers actually go to eat there and the owner, John Stage, besides being a BBQ genius is a badass biker himself. His original restaurant up in Syracuse (which is still in business) is the real deal. 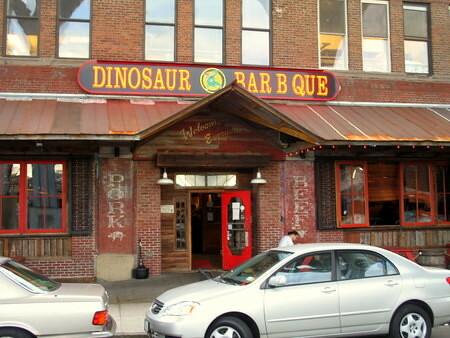 Dinosaur also opened a Rochester location in 1998 as well. Ever since the New York City branch opened in December 2004 I’ve been a huge fan of the restaurant and its food. Despite the tough biker image, the owners and the people who work there are as nice as can be and the Q itself holds up to some of the best barbecue I’ve had across the country. Stylistically, its hard to tell what BBQ region its emulating — they have both Carolina and Memphis-Style pork and also BBQ chicken and Texas-style Brisket, and have things like Churrasco chicken sandwiches and BBQ Cuban sandwiches on the menu. 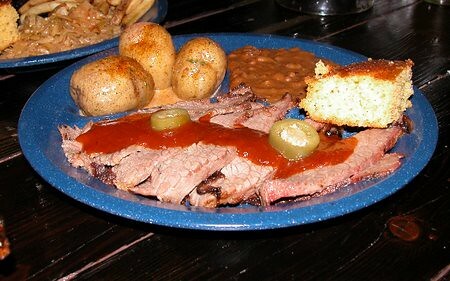 If pressed, I’d have to say this is really a New York Style of BBQ that is now slowly emerging and becoming its own. Storefront on West 131st Street in Harlem. 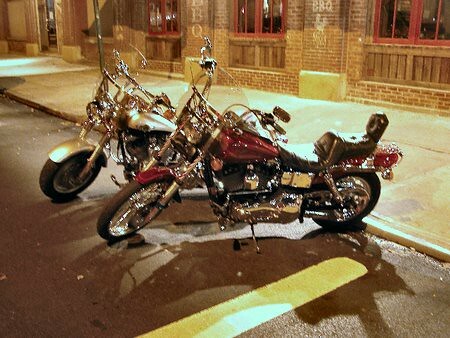 It’s not uncommon to see a lot of these parked outside, given Dinosaur’s biker bad boy image. 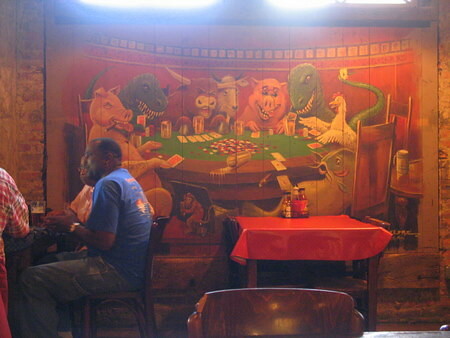 I love the bar area at Dinosaur, you really feel like you are in a true roadhouse in the middle of NYC. Click on the “Read the rest of this entry” link below to see more photos and commentary. 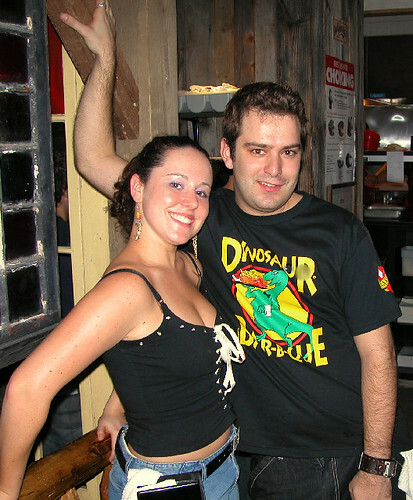 A busy night at Dinosaur, shortly after its opening in December 2004. The interior of the men’s bathroom in December 2004. Dinosaur encourages graffiti in its bathrooms. 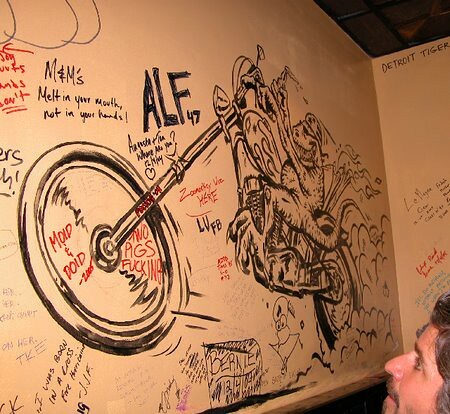 Right now that dinosaur on a hog picture is no longer visible because every square inch of the walls is covered in graffiti. I wonder if at some point they’ll paint it over and start again. 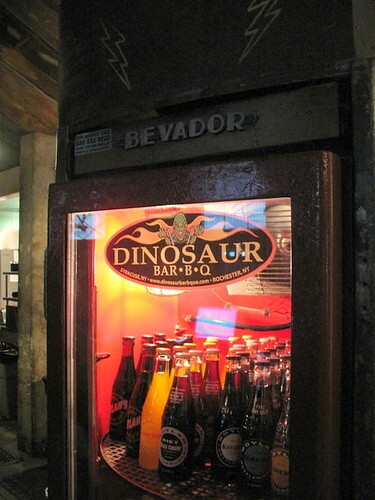 The Bevador, Dinosaur’s vintage soda cooler. Owner John Stage (right) with one of the other main pit masters (2004). 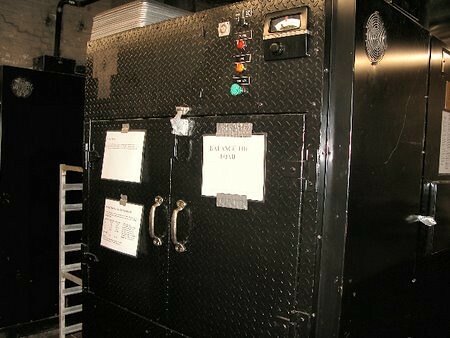 Dinosaur has 3 J&R “Oyler” smoking units which in total allow the restaurant to smoke up to 2400 pounds of meat at a time. 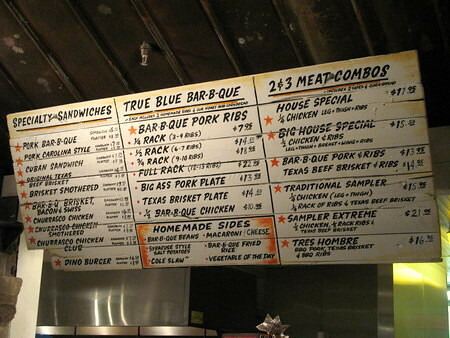 Because this is an urban setting, and smack in the middle of Manhattan, the restaurant uses any kind of BBQ-friendly woods (Hickory, Cherry, etc) that are available locally at any given time, so there is some variation in the smoke flavor depending on what time of the year you eat there. 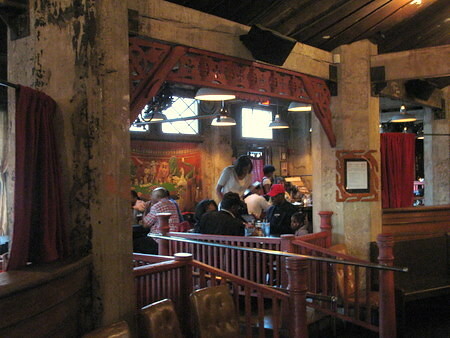 Back when the restaurant opened in 2004, a few of the initial reviews implied that the restaurant didn’t use much wood because they couldn’t smell smoke in the dining room. 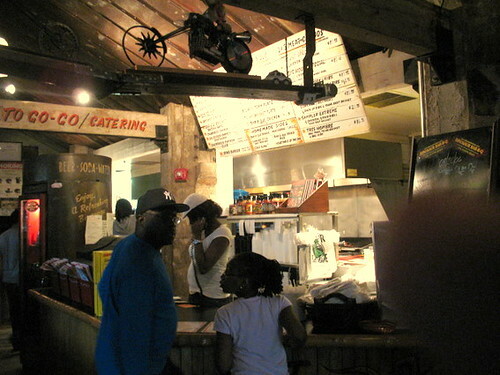 Having been in Dinosaur’s smoking room and seen the cords and cords of wood that the place goes thru, and having sampled their barbecue many times, I can assure you they use a TON of wood in their ‘Q. 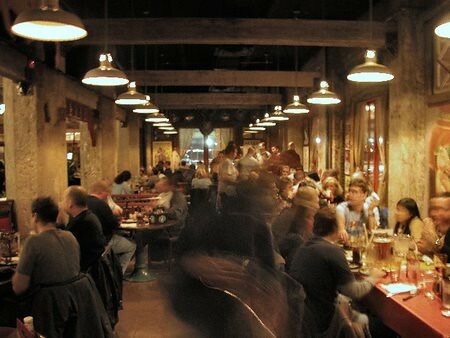 The reason why you can’t smell smoke is because the restaurant has a massive ventilation system which New York City required they install for health and safety reasons. 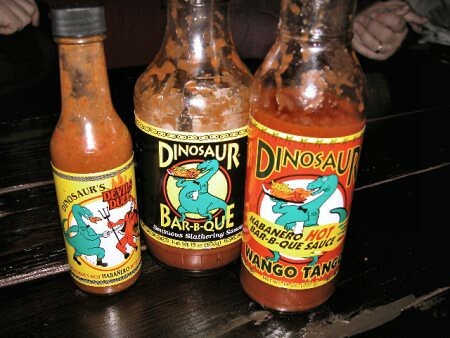 Dinosaur’s BBQ and hot sauces. By far my favorite is the Wango Tango, its got the sweetness and tangyness of the regular BBQ sauce, but its got a fair amount of habanero chile in it as well. BBQ Chicken with Honey Mustard Sauce. I’m a huge fan of the BBQ chicken at Dinosaur, its something they take extra care with to keep juicy and moist, unlike a lot of other BBQ places that see chicken as an afterthought. This entry was posted on Tuesday, September 26th, 2006 at 10:41 am and is filed under Food, General, Links, New York City, New York State. You can follow any responses to this entry through the RSS 2.0 feed. You can leave a response, or trackback from your own site. Man, when I started reading I thought the entire rest. would be dino themed, but it still looks like a pretty eventful place. BBQ is huge in SC and prob not nearly as trendy as in the City. But I think the Bevodor stole the show, they should mass market that thing! I would pay big to have a dino themed cooler in my place! Check out my blog at, http://underdogs.wordpress.com , for some satire on pretty much anything and everything. I have a Bevador refrigerator that is in parts but I believe is all there. If that’s what you need to finish your BBQ place let me know. 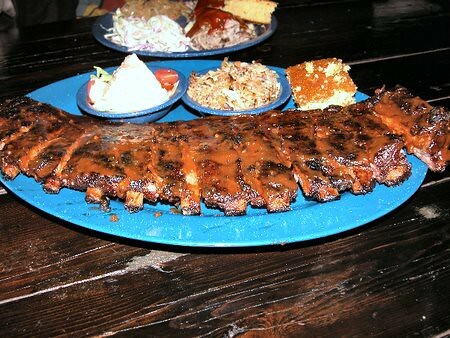 I’m looking at the waiter in the blue T-shirt with the tray full of food, and a little farther down, the picture of a slab of ribs, and I’m thinking, “When are they going to open one of these in Orange County, California?” Yum, yum, yum, yum YUM!!!! I also heard they are talking about outlawing transfats in New York City. Oh, what is this world coming to? I ate there shortly after it opened, which was also shortly before I moved from NY to LA. Not only was the food excellent (the brisket and the pulled pork were my favorites that night), the prices were low (especially by NYC standards), the atmosphere fun, and the service friendly and punctual. They also had a really impressive beer selection. Hailing from Syracuse, I can tell you Dinosaur is definitely the best restaurant there. If the place down here is even half as good as it is up there, you’re in for a treat. It’s so popular upstate that I even saw a bus pull up one night and people get their wedding pictures there. I guess it happens all the time. 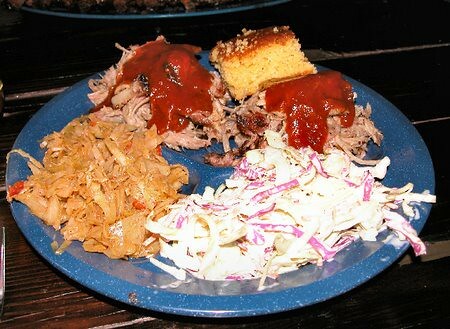 The pulled pork is definitely their signature plate but just about everything on the menu is good. Also, it’s pretty family friendly if you don’t mind a few low cut shirts and rough biker types. 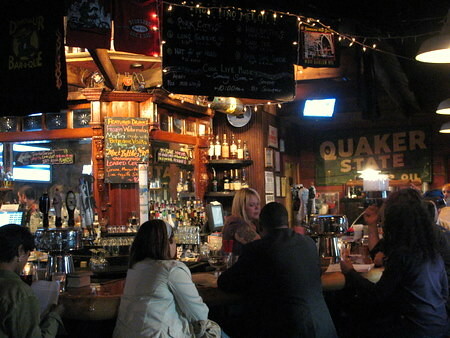 I’m going to try Bar BQ in Brooklyn next month…have you sampled that goodness yet? I ate there once. Kind of a pain to get down there but that area is on the map to redevelop into the next restaurant row. As long as they make it more accessible I’m all for it. this restaurant seems to have sprouted out of nowhere. however, the food is heavenly! 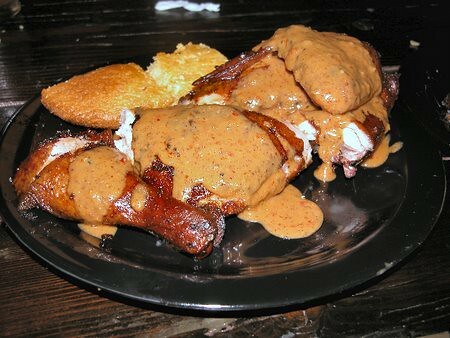 chicken bbq – never had anything like these before. Moved to Georgia from Syr. in 2004. Can’t find anything nearly as good as the Dino. Go, you won’t be disappointed. GOD I MISS THAT FOOD! When we moved to Florida from Rochester two years ago, the loss of Dinosaur BBQ was at the top of the list in terms of things to be missed. I’ve tried a lot of barbeque but nothing has ever come close to touching Dinosaur. Reading this makes my mouth water, if you ever get the chance to eat at one of their restaurants, don’t pass it up, you won’t regret it! 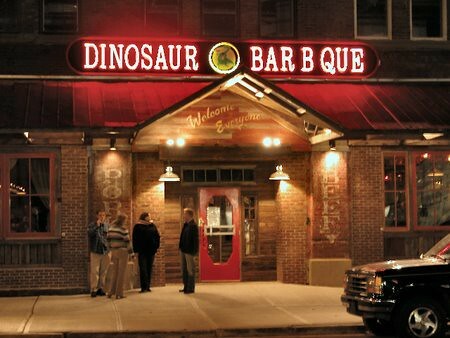 When I lived in Rochester, NY, the Dinosaur Bar B Que was always a popular place to go with friends (except for the vegetarians!). 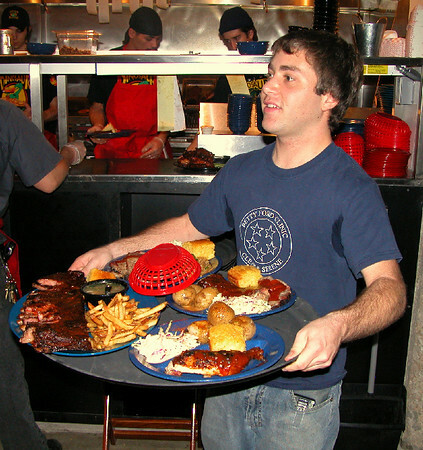 I don’t know if the same is true at the NYC Bar B Que, but on a weekend the wait to get a table for four in Rochester can stretch over an hour — and people will gladly wait. I will make home for the Bevador even if it is in pieces. Give me a call. I have a Bevador beer cooler that i am looking to sell. In good shape ,heavy, in working order. If interested give me a call.585-392-7886. Buy it before I fall in love with it and keep it.